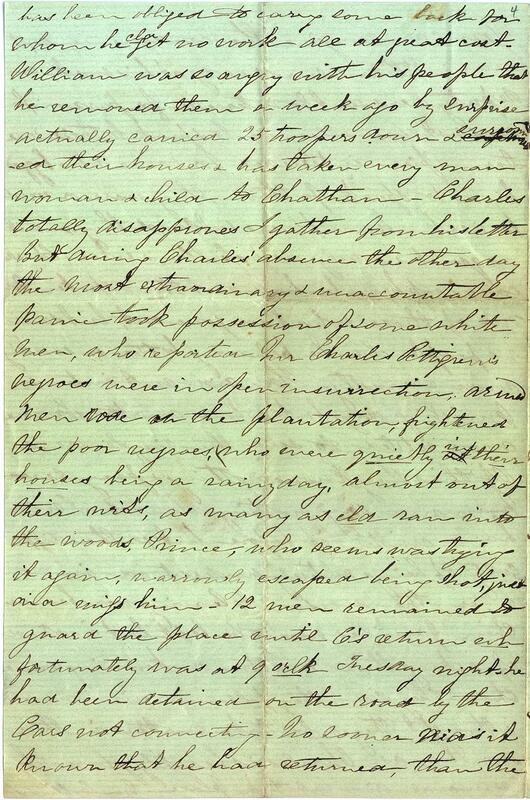 Item description: In this letter, 22 March 1862, Jane Caroline North Pettigrew wrote to her mother, Jane Petigru North, about her husband’s plans to remove their slaves from Magnolia and Bonarva plantations to Chatham County in central North Carolina, in advance of an imminent invasion by Union forces. 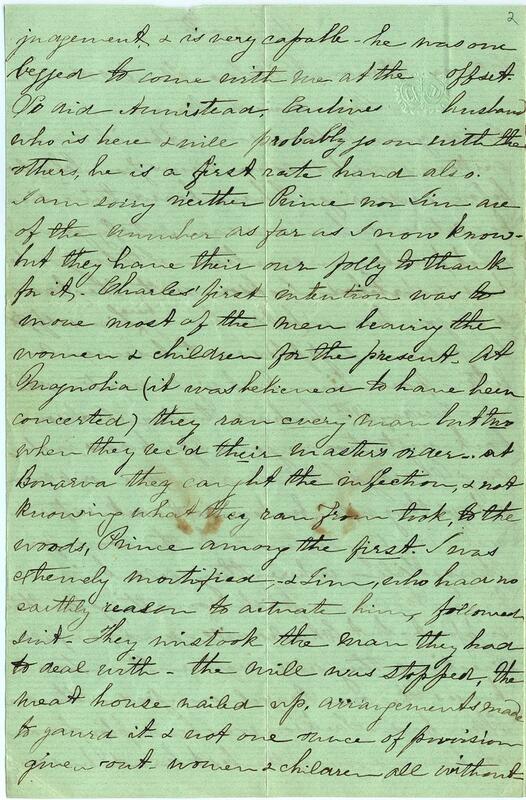 The letter describes an initial and brief escape to the woods by some of the slaves, Charles Lockhart Pettigrew’s punitive response, and a subsequent incident in which armed white men rode onto the plantation to put down an unfounded rumor of slave insurrection. Item citation: from folder 252 in the Pettigrew Family Papers #592, Southern Historical Collection, Wilson Library, University of North Carolina at Chapel Hill. 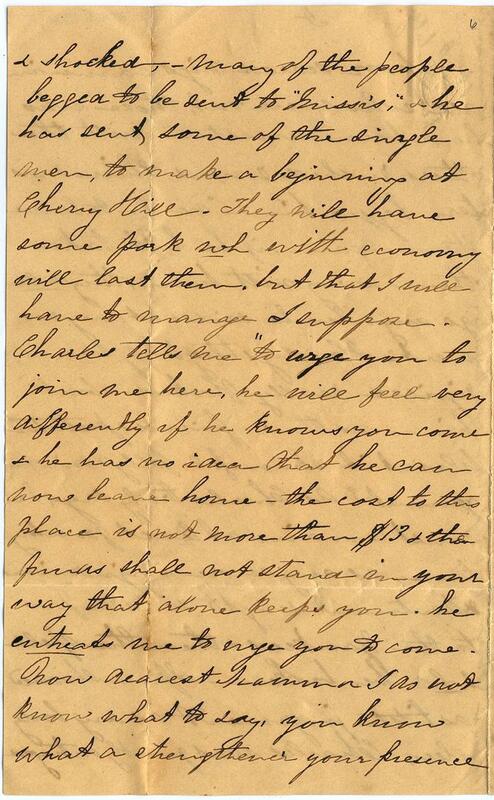 I rec’d your letter soon after it was written, & waited some news from Charles before answering. I have heard twice since he returned home, & can satisfy you on most points you mention. 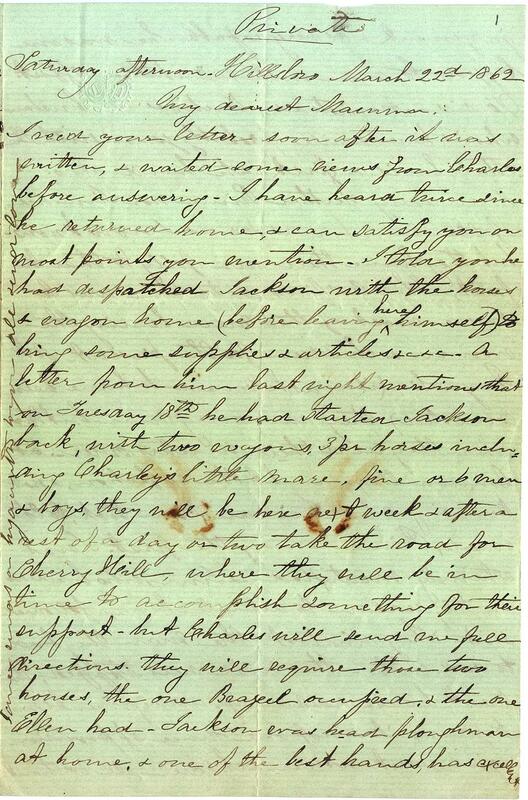 I told you he had despatched Jackson with the horses & wagon home (before leaving here himself) to bring some supplies & articles & c & c. A letter from him last night mentions that on Tuesday 18th he had started Jackson back, with two wagons, 3 pr horses including Charley’s little mare, five or 6 men & boys, they will be here next week & after a rest of a day or two take the road for Cherry Hill, where they will be in time to accomplish something for their support – but Charles will send me full directions. They will require those two houses, the one Brazeel occupied, & the one Ellen had. Jackson was head ploughman at home, & one of the best hands, has excellent judgement & is very capable – he was one begged to come with me at the offset. So did Armistead, Carlines husband who is here & will probably go on with the others, he is a first rate hand also. I am sorry neither Prince nor Jim are of the number as far as I now know – but they have their own folly to thank for it. Charles’ first intention was to move most of the men leaving the women & children for the present. At Magnolia (it was believed to have been concerted) they ran every man but two when they rec’d their master’s order_. at Bonarva they caught the infection, & not knowing what they ran from took, to the woods, Prince among the first. I was extremely mortified, _& Jim, who had no earthly reason to actuate him, followed suit. They mistook the man they had to deal with_ the mill was stopped , the meat house nailed up, arrangements made to guard it_ & not one ounce of provision given out_ women & children all without_ You can imagine the consequence, next morning every man was ready at his work, a deputy was sent to intercede for pardon, he was not even allowed to speak to their master. Spier interceded for some who begged him to speak for them, they were ordered to work _ humbled and subdued they went as quiet & orderly as possible, & when Charles came up here, he had not then spoken to one of those who had gone out, but said no people cld be behaving better or working more earnestly. He did not intend punishing any, but when matters became more settled, to sell the ringleaders_ Of this they know nothing & pray dear Mammma say nothing about it. 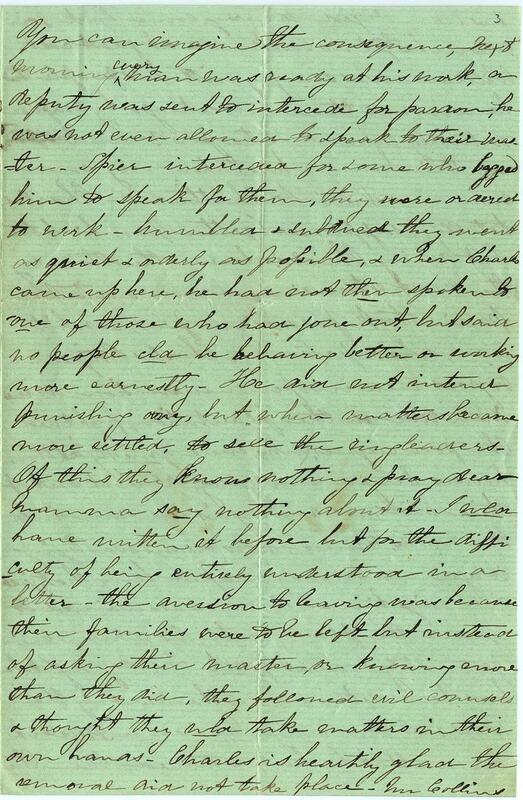 I wld have written it before but for the difficulty of being entirely understood in a letter _ the aversion to leaving was because their families were to be left _ but instead of asking their master, or knowing more than they did, they followed evil counsels & thought they wld take matters in their own hands. Charles is heartily glad the removal did not take place _ Mr Collins has been obliged to carry some back for whom he cld get now work all at great cost. William was so angry with his people that he removed them a week ago by surprise actually carried 25 troopers down & surrounded their houses & has taken every man woman & child to Chatham _ Charles totally disapproves I gather from his letter But during Charles’ absence the other day the most extraordinary & unaccountable panic took possession of some white men, who reported Mr Charles Pettigrew’s negroes were in open insurrection, armed men rode on the plantation, frightened the poor negroes, who were quietly in their houses being a rainy day, almost out of their wits, as many as cld ran into the woods, Prince, who seems was trying it again, narrowly escaped being shot, just did miss him _ 12 men remained to guard the place until C’s return wh fortunately was at 9o’clk Tuesday night. he had been detained on the road by the Cars not connecting _ No sooner was it known that he had returned, than the poor scared nigs came in all who were out, those who had been arrested!! with the others rushed round their master, begged him “never to leave them again, if he left take them away with him, they wld go anywhere he said & at any moment“ He says they truly seemed rejoiced, really flocked about him as their friend & protector Wasn’t it shameful folly & mismanagement? 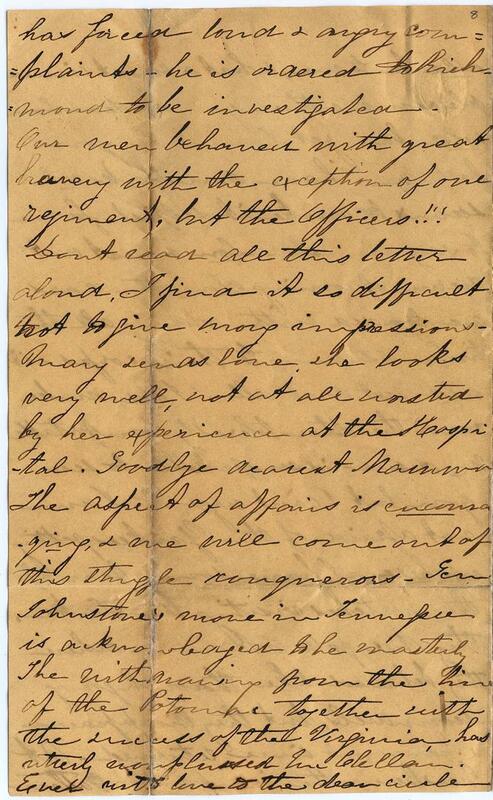 As Charles truly says, he must remain at least for a long time, as any more injudicious treatment might send a few to the Yankees, & then the spell wld be broken _ Spier showed as little judgement as any body else, Charles was greatly outraged & shocked, many of the people begged to be sent to “Missis,” & he has sent some of the single men, to make a beginning at Cherry Hill. They will have some pork wh with economy will last them, but that I will have to manage I suppose. Charles tells me “to urge you to join me here, he will feel very differently if he knows you come & he has no idea that he can now leave home _ the cost to this place is not more than $13 & then funds shall not stand in your way that alone keeps you. he entreats me to urge you to come. Now dearest Mamma I do not know what to say, you know what a strengthener your presence wld be to me, what a most sincere pleasure either you or dear Lou wld be. yet I am sure you both wld have drawbacks wh seem to make it selfish for me to say much_ Lou must not dream of coming alone the cars are loaded with soldiers all the time returning to their corps & it wld not do at all. I cld make one or the other tolerably comfortable My desire is unspeakable to see you, but I can’t urge it. I am not afraid of the Yankees getting up here. I have some fear of the wretches visiting the Lake. They did go to Columbia where they behaved like thoroughgoing scoundrels, but they disappeared & have not since returned. At New Berne the incapacity of Gatlin has forced loud & angry complaints _ he is ordered to Richmond to be investigated. Our men behaved with great bravery with the exception of one regiment, but the Officers.!!! Don’t read all this letter aloud, I find it is so difficult not to give [wrong?] impressions_ Mary sends love, she looks very well, not at all worsted by her experience at the Hospital. 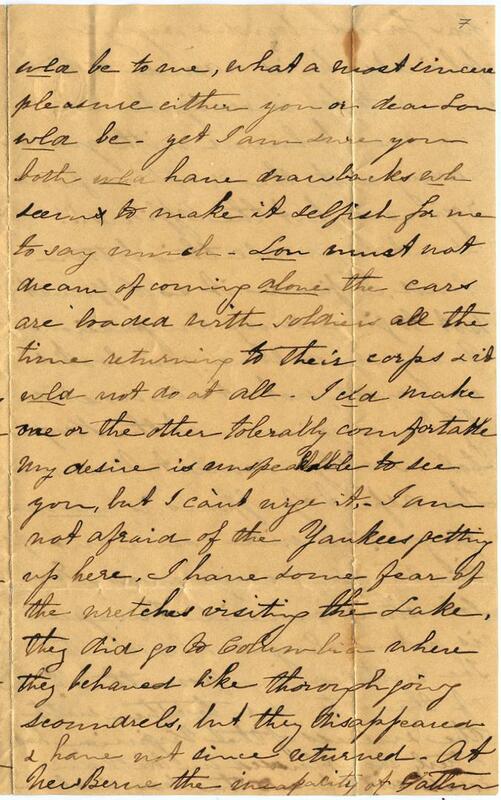 Goodbye dearest Mamma The aspect of affairs is encouraging, & we will come out of this struggle conquerors _ Gen Johnstone’s move in Tennessee is acknowledged to be masterly The withdrawing from the line of the Potomac together with the success of the Virginia has utterly nonplussed McClellan. Ever with love to the dear circle Your own loving daughter C.P. How is Minnie I have not heard lately. 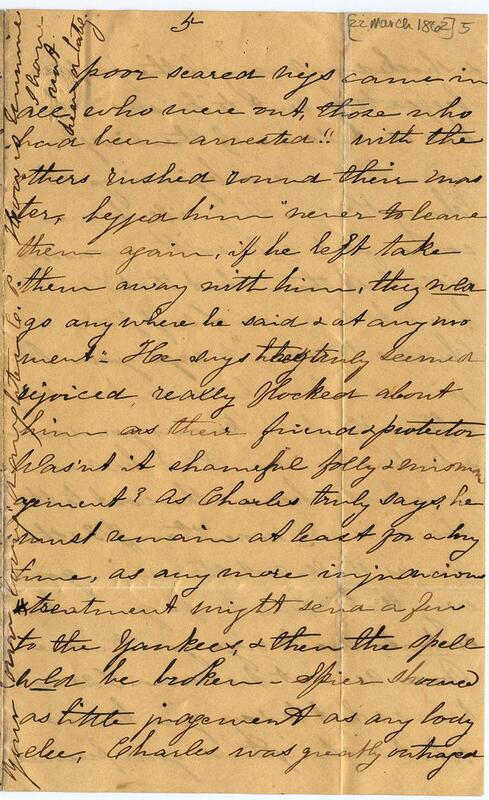 This entry was posted in Southern Historical Collection and tagged Bonarva Plantation, Charles Pettigrew, Jane Caroline "Carey" North Pettigrew, Jane Petigru North, Magnolia Plantation, slave insurrections, slaves. Bookmark the permalink.